Peregrine falcons dive at high speed like a guided missile because it allows them to catch agile prey, according to new research. The risky behaviour has mystified scientists for years because it puts the world’s fastest animal at extraordinary risk – and requires great mental skill. Now computer simulations have solved the puzzle by showing it boosts the raptors’ ability to execute manoeuvres required to nab animals that would otherwise escape. 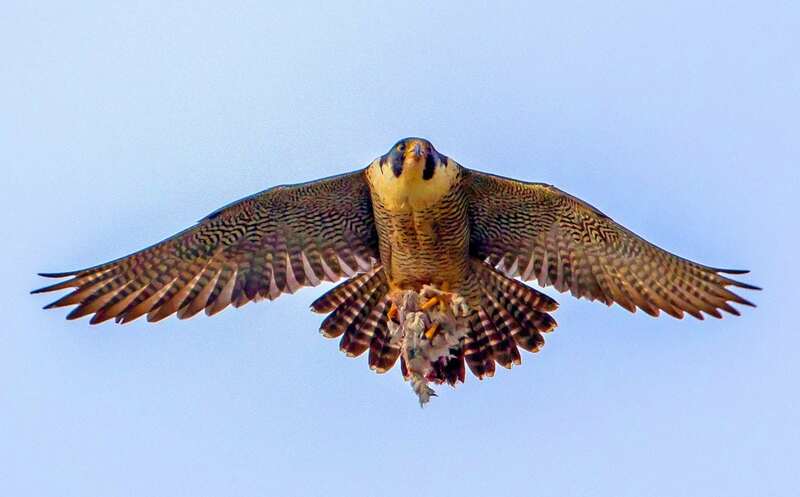 His team previously attached miniature video cameras and GPS trackers to the backs of eight Peregrine falcons to show how they attacked prey from high altitude using the same steering rules as man-made missiles. But it remained unknown why the legendary bird choose to catch prey by diving from great heights at speeds faster than any other animal. The US Air Force, who have funded Dr Mills and his colleagues at the University of Oxford, say lessons from the birds’ control strategy could help create the ‘ultimate drone killer’. 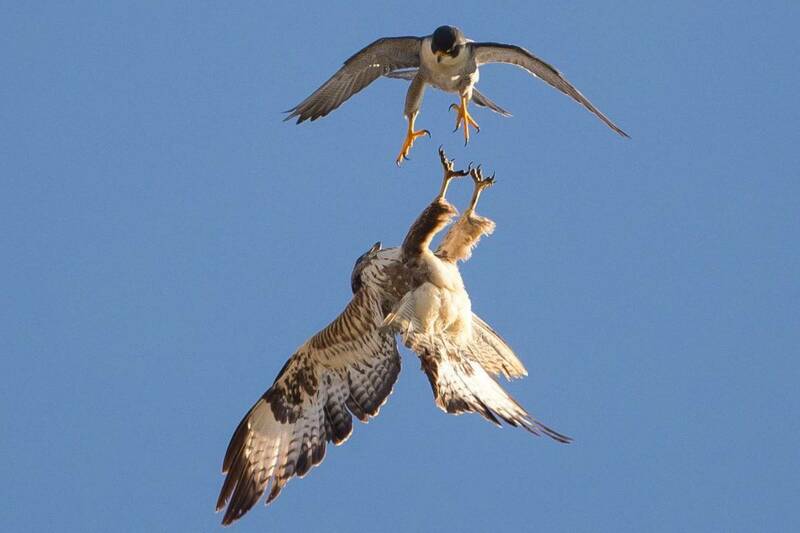 They were earlier surprised to find the peregrine falcon’s ‘terminal attack’ trajectory followed a mathematical guidance law used to steer homing missiles to their targets. Known as ‘proportional navigation’ (PN), the system does not make it necessary to know a target’s speed or distance. Instead it relies on what happens to the missile’s line-of-sight as it chases its target. If the line-of-sight does not change direction as the range closes, it means the missile is on a good interception course. When a course correction is needed, the rate of turn is proportional to the speed at which the line-of-sight angle changes. The scientists found that peregrine falcons followed this rule, while making adjustments for their flying speed – a lot slower than that of a guided missile. The peregrine falcon feeds almost exclusively on medium-sized birds such as pigeons and doves, waterfowl, songbirds, and waders. Other than bats taken at night, the peregrine rarely hunts mammals, but will on occasion take small species such as rats, voles, hares, shrews, mice and squirrels. It can reach speeds of more than 240 mph during its fast, controlled, dives – known as a ‘stoop’. It uses that speed to kill other birds in mid-air. To investigate the peregrine’s strategy, Dr Mills and colleagues built a physics-based computer simulation of bird flight that pits falcons against prey. The model described in PLOS Computational Biology incorporates the aerodynamics of bird flight and how birds flap and tuck their wings. 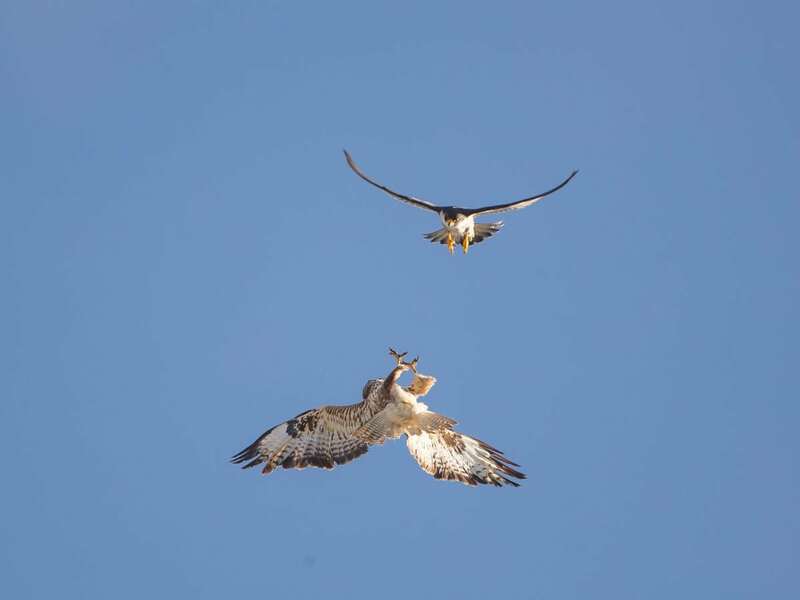 It also includes how falcons perceive their prey and react to it with delay – before targeting it like a missile. 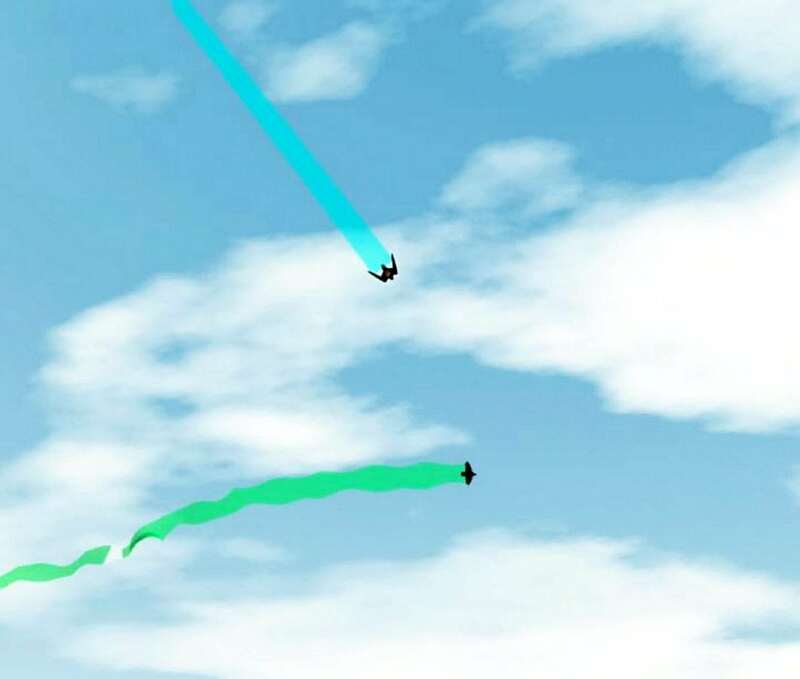 By running the simulation millions of times, varying the falcon’s attack strategy on each occasion, the researchers found high-speed dives enable it to produce much higher aerodynamic forces for manoeuvring. This maximises their chance of seizing agile prey. But the dives still require very precisely tuned steering for a falcon to attack successfully, revealing the stoop is a highly specialist hunting technique. The team found optimal tuning of the mathematical laws that control steering in the simulation corresponded closely to measurements for real falcons. 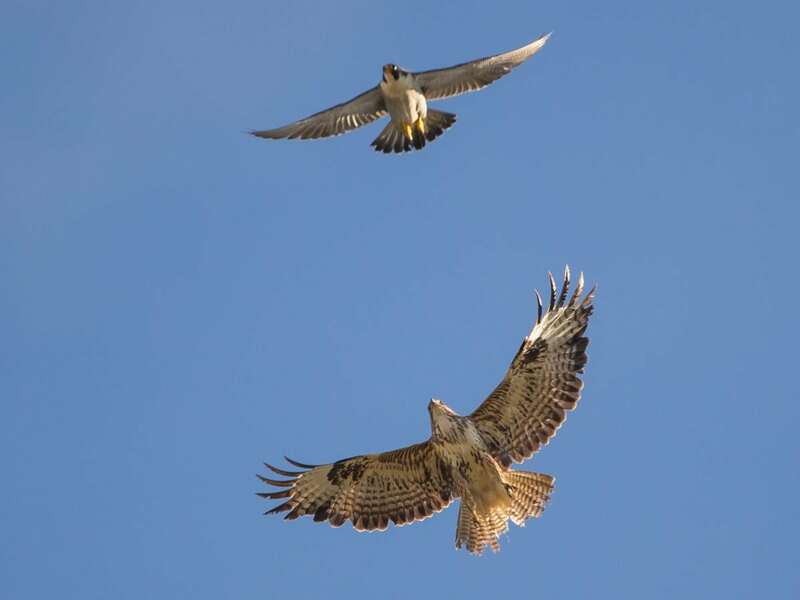 They are now extending their simulation to explore why different raptor species, including the goshawk and the sparrow hawk, have unique attack strategies, and to identify why different raptors often specialize on different types of prey. They are also studying the best escape tactics that prey can employ to evade capture.